If I’m being honest (I can be honest with you, right? 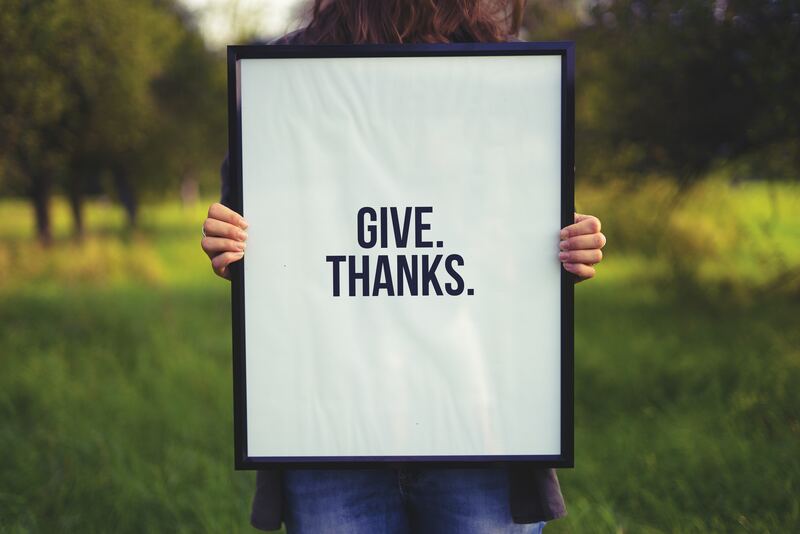 ), the thought of Thanksgiving this year didn’t fill me with all sorts of warm, holiday fuzzies, but with a sense of heaviness. Of course, it’s at Thanksgiving that we tend to look back on the year so far and reflect on the things we’re thankful for. It’s a great time to remember the highlights of the year, to look back on the things the Lord has done and celebrate them. This year, though, I’m having a hard time making that list. 2017 has probably been one of the hardest years in my entire life. My chronic migraine condition only intensified and each treatment that has raised my hopes has resulted in no reprieve. The low point of it all for me personally was October 1, where after delivering one of my better sermons that I can remember, I had to step down and walk away from ministry indefinitely. I know that isn’t a healthy attitude to have, and there certainly are things that I am thankful for. I’m thankful for our new corgi puppy, Vinny1, he’s just the best. I’m thankful that despite me losing my job, Adrienne has one she enjoys that pays her well so we don’t have some of the stress that usually comes along with unemployment. Of course, I’m thankful for Adrienne herself, who has been incredibly supportive and understanding through all of this. There are things that I can point to, and I’m actually trying to sharpen that skill by writing 3 things I’m thankful for in my Day One journal every morning. Still though, I felt like I needed to do something about my attitude, so I turned to the Scriptures. Many of the Psalms are laments, or mourning songs. They’re not the happy-go-lucky dance numbers churches sing these days, they’re full of sorrow and despair. They acknowledge and even lean in to those emotions, rather than trying to clap them away. It’s in these songs that we can learn a lot about the way we relate to God and what it means to truly be in relationship with him. Psalm 77 is a fantastic example of not only this, but also the antidote to despair. How do we shake ourselves out of that funk? I sought the Lord in my day of trouble. I refused to be comforted. I meditate; my spirit becomes weak. The psalm starts with Asaph reflecting back on his pain and depression. He’s crying aloud to God, something we probably don’t do enough of. It says his hands were lifted up all night long. The past-tense here shows that this is not a new trouble he’s dealing with, he’s been walking with this for a while. It shows not only how long he’s been oppressed by it, but also how long he’s been praying over it. When it says, “I think of God,” it’s literally the words “I remember God”. When he remembers God, he’s groaning; the very thought of God is causing a restlessness in him. Why? If you’ve ever been through anything truly difficult, you probably don’t have to ask that question. Meditation isn’t making him stronger, it’s actually weakening his spirit. I am troubled and cannot speak. I meditate in my heart, and my spirit ponders. and never again show favor? Has his faithful love ceased forever? Is his promise at an end for all generations? He’s sleepless and restless. He’s troubled to the point of silence and exasperation. The second stanza here is what gives us insight to the root problem, however: doubt. We’re given this window into his doubts and for me, they sound a little familiar. It’s not the same song I’m singing over here, but man if it isn’t in the same key. It’s voicing these kinds of doubts and frustrations, though, that helps us see how misguided they are. Has God’s faithful love ceased forever? His unfailing love is, just that, unfailing. Of course it has not stopped. Has he forgotten to be gracious? How could he possibly forget anything? And grace isn’t something he decides to do, it’s who he is. He hasn’t forgotten to be gracious any more than I’ve forgotten to be tall. After this second Selah, the Psalm takes a turn. Now his prayer is starting to change. yes, I will remember your ancient wonders. and meditate on your actions. God, your way is holy. What god is great like God? you revealed your strength among the peoples. the descendants of Jacob and Joseph. The CSB translates the first two lines a little funny there. The ESV says, “Then I said, “I will appeal to this, to the years of the right hand of the Most High.” I think the way to understand the CSB’s translation is this: Asaph is grieved that things used to be good and now they’re bad. He’s remembering the way things used to be. The way the Lord used to remember his people. If you notice, the word “I” disappears halfway through this chunk. It’s been heavy in the beginning of the Psalm and now it will be absent. I think that, in and of itself, can teach us something. He expounds, remembering God’s ancient wonders. He remembers God’s holiness, his power, the way he redeemed Jacob and Joseph. Why mention Joseph? Joseph’s whole story is things going terribly and then the Lord using them for his good purposes. He continues and cranks up the poetry. The water saw you, God. The water saw you; it trembled. The clouds poured down water. your arrows flashed back and forth. lightning lit up the world. The earth shook and quaked. but your footprints were unseen. by the hand of Moses and Aaron. The splitting of the Red Sea, the fire on Mount Sinai, God’s power is dramatic and unstoppable. Jesus demonstrated this power as he calmed the winds and waves. This shuts down any ounce of deism in us, that may be tempted to think that God has created the world and then left it alone to its own devices. He is present and active. The antidote to hopelessness and despair is to remember that we serve a God who is powerful and in control. That he created the world and he is active in it. That his power knows no bounds and nothing is too difficult for him. When you read that last stanza, it may seem like the last two lines are a little out of place. Sure, it’s important that God lead Israel, but it hardly compares to all these dramatic, powerful acts, does it? Surprisingly, those two lines are perhaps the most important of the whole Psalm, they wrap it up in a nice bow. See, the miracles, the displays of God’s power are not the goal, they’re means to an end. God’s concern in all of these instances is for his people. He splits the sea to lead Israel out of slavery, not to play with water. The big things like miracles and the small things like day-to-day troubles are all leading to the same place. I know that he could heal me, but for whatever reason he has chosen not to. Whether he chooses to work a miracle or chooses to allow me to carry this heavy load, he still has the same goal in mind. He’s using it to make me more like Christ. He’s developing characteristics in me that he wants to see. He’s bringing glory to himself. The question isn’t does God heal or does he not care. It’s not a choice between his favor or his indifference. The binary here is either demonstrating the power of God or joining Christ in his sufferings. Either way, he’s using this for his glory. When you step back and reflect on who he is and what he’s done, it changes your perspective. I’m thankful that he’s not wasting my pain. It’s bringing glory to him, he’s using it in some way that maybe I don’t even realize at this point. I’m thankful that he’s in control. That whatever I go through, he’s leading me through it and going through it with me. That Christ endured suffering I couldn’t ever comprehend and he identifies with me in that. I’m thankful that I can trust him because he has demonstrated his trustworthiness. He has been faithful, even when I have not. Because of that I can trust him. His sovereignty means that the proper perspective to have says that he’s only putting me through this agony because he’s using it for his glory and my benefit. I may not understand why at the moment, but like a child undergoing the sting of the vaccine, I can trust that the pain the Father puts me through is ultimately for my good. Psalm 77 helps me see that when I step back and have a cosmic perspective, I actually have a lot to be thankful for. Even if it doesn’t feel like it sometimes. And if you are in Christ, you do too. He’s working everything, even the worst things that happen to us, out for his glory.